Okay, we’ve all made the jokes about Botox and frozen faces, but when you start seeing those crow’s feet between your eyes, a frozen face starts to seem like a great idea. Luckily, Botox Cosmetic can actually help you reduce the appearance of fine lines and wrinkles without freezing your face. While a dentist may not seem to be the ideal practitioner to provide Botox injections, they may just be. 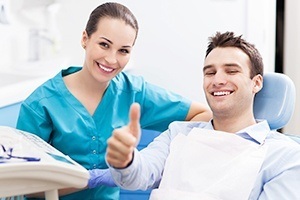 Dentists have advanced training in the way facial structures work together, including the minute movements of muscles that can lead to wrinkles. At Advanced Dental Care of Springfield, our skilled team of experts are happy to offer Botox Cosmetic treatments to help our patients look and feel more youthful. If you’re interested in Botox, don’t hesitate to ask about these treatments at your next dental checkup our give our Springfield dentist a call today. Botox is the brand-name for injections of the botulinum toxin that can be used to control muscle movements. 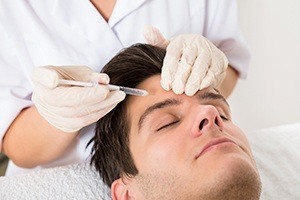 Botox Therapeutic injections have been used for decades as a treatment for muscle strain and damage and a variety of other concerns, including TMJ dysfunction and migraines. Botox Cosmetic is used to limit unconscious facial muscle movements that can lead to fine lines and wrinkles. You know the smooth, hospital corners look of your bed right after you make it? That’s what youthful skin is like. Clean, smooth, and wrinkle free. Now, what happens the first time you sit on the newly-made bed? Some wrinkles appear, but if you stand up, they are easily smoothed away. What happens after you sleep in a bed? You wake up to some wrinkles that can’t just be smoothed away. Skin is like the too. Over the years of smiling, laughing, and scrunching up our eyes wrinkles appear in the smooth surfaces of the skin, and they start to stick around instead of smoothing back out. Botox cosmetic limits the appearance of fine lines and wrinkles by preventing unconscious and minute muscle movements that lead to fine lines. The big, intentional movements like the crease in your forehead when you’re concentrating really hard, will still be possible, but microscopic muscle movements below the skin will stop. This depends on the individual, but most people see their desired results with two to three retreatments each year. The treatments are quick, so you can even pop in over your lunch break or receive Botox injections as part of your six month exams. Will My Face Look or Feel Frozen? Just to be clear – No. Botox doesn’t actually make your face look or feel frozen. Immediately after your injection, you may notice some changes in movement, slight swelling, or redness. Within a few hours to a day after treatment, you should feel completely back to normal and start to see diminished appearance of your fine lines. If you continue to notice a difference in the way your face feels after the first 48 hours, call our office.